For Mac Users, I have noticed they are unable to purchase doubloons through the steam wallet because of some incompatibility, despite checking the Box for "Enable Steam Community In-Game" and relaunching YPP: Darkseas. I am currently asking for a refund from Steam for depositing into that wallet, but a simple fix for this is to take all the doubloon offers In YPP and just transfer them to the DLC-section of Steam. 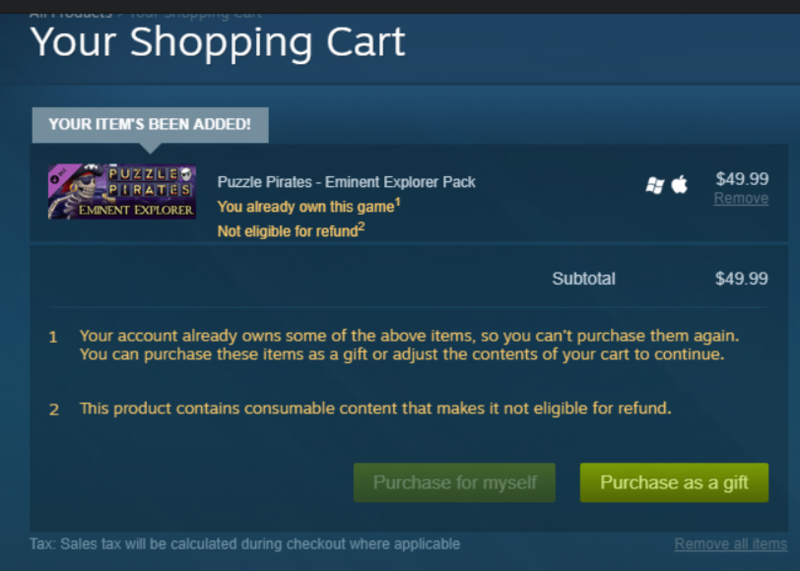 I was able to get the Eminent Explorer Pack DLC through steam, for YPP and have successfully receive the items in the game, but the doubloons being offered IN the game, cannot be purchased due to a bug or incompatibility with needing the Steam Overlay present, or whatever. Doubloons could be DLC content and they can be received in the game through the steam wallet (for the purpose of bypassing the problems mac users are having). Anyone have any thoughts on this? I have both petitioned OM's and the Steam support team about this problem. By the way, this Username does not play on obsidian, obviously, but anyways, have any mac users been through a similar case? Not certain what you're really asking here. If you're asking whether or not anyone has suggested making Doubloons DLC, so that Mac users don't have this issue, I'm not aware of anyone having made that suggestion (but I am terrible at search, so do not put any faith into that statement). There are a few problems with this suggestion. Currently. Puzzle Pirates has a limit on how many doubloons you can buy each month so a single person can't destroy the economy, or even worse, use tons of stolen credit cards to destroy the economy. While this limit can be raised, it does still exist. It will not work as a steam DLC, as steam grants all purchases. I do think steam has DLC that can be purchased repeatedly, but I can't think of any real examples to point to in order to show that is possible. Lastly, I know micro transactions have to share a split with steam if they are purchased through their client, even the old YPP had to do that, if launched through steam, but I think the split is different for DLC listed on the store, which could hinder the idea. The spending limit is there mainly to avoid fraud (this is mentioned somewhere in the documentation). A single person can theoretically cause the doub market to drop a lot, but I don't see why anyone would do this. All three of the Dark Seas DLC packs can be purchased multiple times. As you can see from this image, it won't let me buy the Eminent Explorer Pack a second time except as a gift for someone else.